Why you don’t understand me…. Hi Suz, welcome to my couch. I’ve been looking forward to interviewing you all month. You have some really hard acts to follow after the talent that has been here before you, you know. There was this one guy that threatened to bring his dog you know. Anyway, tell me though, what drew you to begin blogging? You know if your head got any bigger, it would have its own postcode don’t you? Don’t be like that. That’s not very nice. People won’t like you if you’re nasty you know. *sigh* If you say so but I’m a cat so I don’t really care. I know you want to say more, so tell me how long you have been blogging? I actually had a Blogger blog for some years a while ago when the children were a lot younger and I was designing Digital Scrapbooking kits for sale in a couple of U.S. stores. My blog then was a mix of anecdotes and advertising of my designs. When I started working in the disability sector, my time became very limited so I printed off all of my blogs and closed down my site. I began my WordPress Blog in August after I returned from the Hay House Writer’s Workshop in Melbourne. That was in August 2013. So you’re not new to blogging at all? No. Although I really didn’t have the readership and following that I do now. There is a lot more interaction with others in WordPress and I love it. Will you please stop butting in? I’ve got an interview to run here. Does this blog of yours have any particular theme? When I began I wanted to write about depression and recovering from that. It was something that was very relevant at the time with the GG going through tough times and me having been there before and still having occasional lapses. However, things evolved and my blog became about being honest with yourself and looking for the beauty in the every day. Then I felt compelled to write about grief and loss and miscarriage. There are many things I write about really so I guess I have no particular theme apart from remaining positive and living life to the fullest. Well we can all do with a bit of positivity in our lives that’s for sure. I’m positive that you’re going to feed me tonight. What about challenges? Do you have challenges in your life that you blog about? You know cats don’t have challenges right? Oh, apart from working out how to get to that canary you got for Christmas. My life sometimes seems like one long challenge. This week has been pretty rough and I’ve stepped away from the computer because of it. I asked my boss today why it was one thing after another and she replied “Because when you get over this bump you have something else that you can write about and help people with”. I guess that’s one way of looking at it hey? I’ve said it a million times – “Blogging is the best (and cheapest) form of therapy”. You’ve probably said it more than that you know!! 🙂 I know because I hear it. Anyway, how often do you blog? You always seem to be in the computer room. When I’m on a roll, I try to blog about three times a day (roughly every 8 hours) however lately it’s only been about once a day. The Fellow Blogger series ends this evening with moi but I will consider running it weekly after this. I still have two love languages (as defined by Gary Chapman) to blog about also. Three times a day is heaps you know. That time could be spent laying behind the curtain in the sun. Like right now you mean…..
No. I still have more questions to ask. Like, where do you get your inspiration for your posts? Wow. Like so many others, I find my inspiration from everywhere. Conversations with colleagues, what is happening in my life right now, what I see outside my window…. really the list is endless. Sometimes I read something on another person’s blog that clicks on that little light bulb in my head and I think ‘aha’. I have a large notebook with scribbled thoughts in it that I turn to when I’m lost. Or, I find a quote that I love and create a piece of digital art and then I write about that. I’m thinking of doing a book with my digital art quotes and my thoughts. Yeh, yeh…. so the next question you want me to ask is “Have you gained anything through blogging”? I’ve gained heaps. I have discovered that in this big wide world of ours there are people out there just like me. People who love and laugh and have difficulties in life but pull themselves up and determine to carry on. I’ve gained some friends. And I’ve gained greater self -esteem. Sounds great. I know you’ve been collecting some of the quotes that other bloggers have been sharing with you but do you have a favourite quote? Do you really need to ask that? Well yeh! Because you put it in the questions. Yes. There is one quote that has got me through some really tough times (and believe me there have been a lot of them over the years). I’ve learned that life indeed does go on. Each day the sun comes up again and it is filled with the promise of a new day. Each day is an unblemished canvas. And as long as you are still breathing – life goes on. It might feel as if the air has been crushed from you and there is nothing but darkness ahead but this is fleeting and you will emerge stronger for having endured what you have. Sounds as if you know what you are talking about. Funnily enough – yes I do. The GG complains you are on the computer all the time and surely you aren’t spending all of that time writing, so you obviously read other blogs. What draws you to those other blogs? I follow an awful lot of blogs and each is unique in their own way. I have diverse interests so many of the blogs I follow aren’t just about serious issues but also about craft, writing, poetry or photography. I follow the blogs of fellow Aussies and I also follow blogs that deal with depression, mental illness or grief. I’m drawn to bloggers who are honest and say what they think. I love blogs that are positive and share great stories or hope for the future. I love great writing as well and of course I love to laugh! Okay, okay – sheesh you’re long winded. I’ve had enough and I want to go and eat. Have you put anything in my bowl yet or do I have to nag again tonight? Do you have anything else to say before you vacuum the couch and get my food out of the cupboard? You know you can be really quite rude at times. I don’t know how I put up with you. You love me ’cause I’m cute. What I would like to say is that I’ve really enjoyed getting to know so many of you and learning about you and your blogs. It’s been a lot of fun and I’m hoping to run this maybe as a weekly thing from now on so if anyone is interested, please email me and I’ll get back to you. Blogging has given me so much…. As I was saying, blogging has given me so much pleasure and it is a pleasure to be able to share with you all also. So thanks. Have you finished now? Great!! I’m starving. Joining me tonight is Jurnalist extraordinaire Ned Hickson from Ned’s Blog. To say that I look forward to posts from this man is an understatement. I love his writing and his sense of humour. Ned writes on his About page that he is an editor and humour columnist for the Siuslaw News in Oregon. He has held a few jobs in his life but his latest as a syndicated columnist is the one he loves the most and feels right at home in doing. Ned has several weekly posts such as The Box where he lets loose “Skippy” the blindfolded, rabid squirrel to choose an old photo from the box for Ned to use his Sherlock Holmes skill on deducing what the photo is all about. Each Sunday (or is it Saturday?) 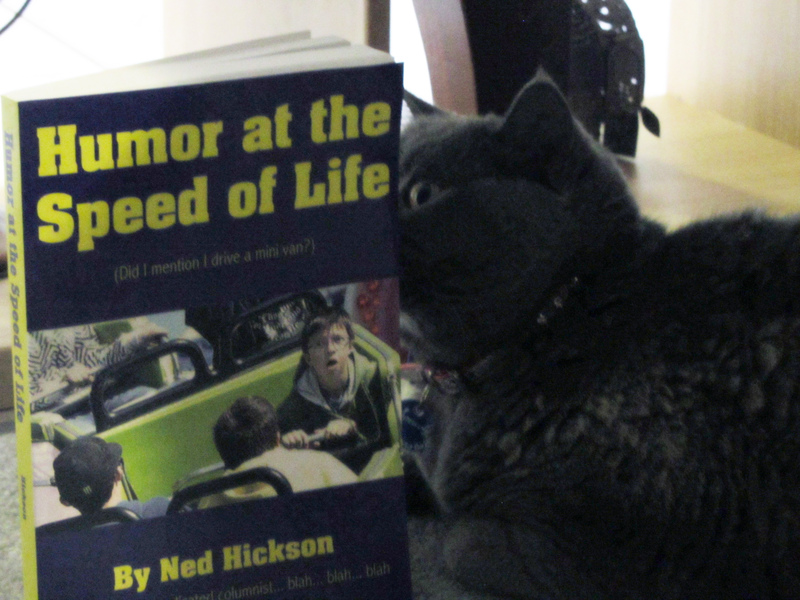 Ned also writes a column called My nickel’s worth on writing with tips and tricks for fellow writers. Apart from his writing tips, his posts are all written with a grain of salt and always elicit a laugh from moi. An example of this is An observation of my fridge. 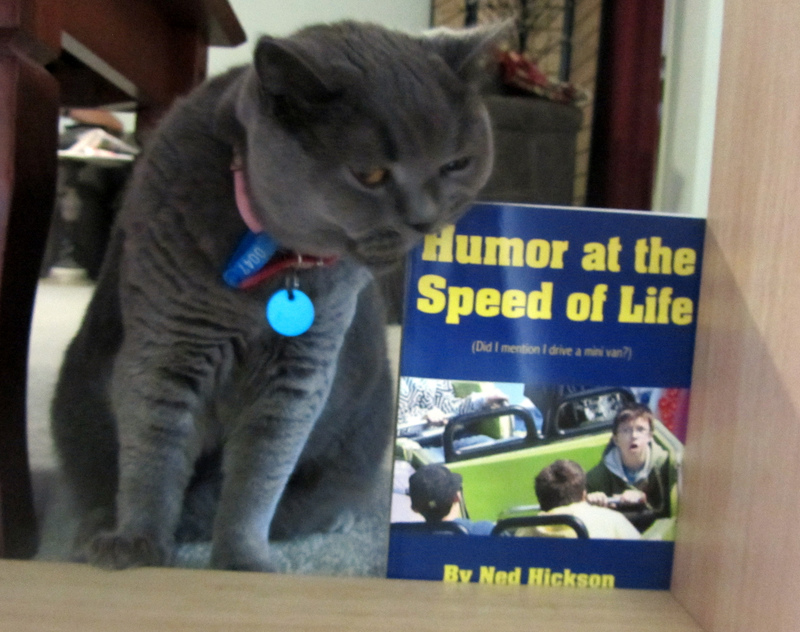 Ned has featured on Freshly Pressed and also has a book currently on sale “Humor at the Speed of Life“. Well Ned, welcome. I’ve been looking forward to having you here on the couch to discuss your blog and what blogging is to you. Tell me what drew you to blogging? I had been hearing about blogging for a several years and, because I am savvy when it comes to all social and technological trends, I immediately assumed it was a network of swingers. Eventually, a friend explained to me what a blog is, and that “everyone” had their own blog. To prove his point, he showed me my Labrador’s blog, StanleySits. That’s when I decided it was time to launch my own blog. If for no other reason than to deny some of Stanley’s accusations about never getting table scraps. Okay, that’s not entirely true. But I’m not going to help Stanley promote his blog by revealing its real name. Let him get his own interview for that. I was also drawn to blogging because, as a columnist, I saw it as a way to connect with readers in ways I can’t through newspapers. Being able to post something and have the chance to instantly communicate with people about it is one of the things I enjoy most about blogging. I have also been able to discover some terrific writers who I now call friends — with the understanding that I never call them directly. Hmmmm okay. I can understand the whole thing about making friends but I’m a little scared about your admission that they don’t want you calling them. So how long have you been actually blogging? I began blogging almost two years ago, when I set a goal of having a site established by my 45th birthday.This was important because I would still technically be younger than Stanley — at least in dog years. I ended up launching my blog in June of 2012, two months before my birthday deadline. That August, the week of my birthday, I was Freshly Pressed for the first time. I didn’t know what that meant and assumed it had something to do with free dry cleaning for a month. *Sue spits out mouthful of water*. Ahhh a fellow Leo! Very cool. Sorry that the dry cleaning gig didn’t pan out for you but Freshly Pressed is pretty cool as well in its own way 😀 Apart from the obvious use of humour, does your blog have a particular theme? I write a weekly syndicated humor column, so the blog is an extension of that. At the same time, it’s also an outlet — or maybe “clearing house” is a better term — for things in my mind that don’t fit the newspaper format. For example, there are weekly features on my blog — This Just In (random snippets of irrelevance from out newsroom), The Box (when I use my “investigative journalism skills” to randomly “identify” weird, unclaimed photos dating back to the 1980s), and Ned’s Nickel’s Worth on Writing (writing tips gleaned from 15 years as a columnist. No, really) — that I probably wouldn’t have pursued had it not been for the freedom of the blog format. Sorry about that. Apology not accepted because we all love it 😉 Like you, I agree that there is a certain freedom in the blogging format. Although you write for a living, do you believe that you have gained anything from your blogging? Aside from tangible examples, like more readers and an opportunity to promote my book in ways I could never do in newspapers, blogging provides an intangible creative writing spark on a daily basis. That spark can come from reading someone else’s blog; responding to, or leaving, a comment; and the chance to occasionally be a guest contributor on someone else’s blog. In addition to meeting new writers and readers, guest blogging offers a chance to write on subjects I may not have otherwise written about. In the case of Black Box Warnings or Thoughts of a Lunatic, the subjects were more serious and forced me to write outside of my comfort zone — which was a great experience. Pushing your comfort zone means expanding as a writer. Except without the weight gain. Bite your tongue. We do not gain weight – we redistribute the areas of our brain to other parts of our body! 😉 Given that you don’t appear to have gained too much weight, how often do you blog? I’m so pleased you explained what that noise was as I was thinking I was going to have to see my doctor about that! 😉 I guess it would be hard to find inspiration for you writing so where do you look for that? Everywhere. Working at a newspaper as a columnist and journalist, the news is always happening around me. I’m also a happily married father of four, which means sometimes we ARE the news. I’m also a volunteer firefighter. Between life in general, my job, my family and firefighting, I’m pretty set on material. I also keep a folder of ideas that I turn to on occasion. Sometimes it’s just a scribbled note, other times it’s a news story I printed up or maybe a photo, but I look through my folder and it almost always gives me an idea. Because of these ideas, my editor would really like to burn this folder if she could find it. But she never will because I keep it in her “In” box, which she never touches. Congratulations on remaining happily married with four children! That’s terrific. I like your idea of keeping a folder of ideas. Many people have a particular quote or mantra that is important to them. Do you have one that you’d like to share? A life spent in pursuit of what can be is better than a life spent pursuing what could have been. It took 10 years, but I’m finally pursuing what can be. Good for you. The fact that you finally achieved your dream is inspirational. And your quote is awesome. I don’t suppose you get much time to read other blogs but when you do, what draws you in? One of the great things about the blogging world is its diversity. I love photography, all kinds of writing, art, travel — and there are bloggers on every subject. What draws me to a particular blog are 1) The Gravitar: It’s my first impression. If it’s interesting or creative, the better the chance I’ll go there. 2) Titles of posts: If they are well worded, funny or creative, I’m hooked. 3) About: When I visit a blog, the first thing I check out is the “About” page, even before I read any posts. I usually gain some insight about the person, which often times adds more to the post. 4) Coffee gift cards: I will skip steps 1-3 if it means free coffee. Well Ned, it’s been wonderful chatting with you. I have to go and add a coffee gift card to my About page right now. Before I do, is there anything else you’d like to share? I just wanted to say how much I appreciate the chance to be here on your couch, especially before my dog. It’s nice to get up for once and not be covered in brown fur. From my dog I mean; I’m actually not very hairy. Sorry I’m a bit behind on this one. Today I would like to introduce you to Dave from Deliberating Dave. He may be a familiar face to some but to others not so well known.. Dave is a passionate man who writes about what he believes in. In his About page, Dave describes himself as an average American who also has a wife and family and works 50 hours each week. Dave is interested in politics of the world but mainly those of the U.S. You can find his blogs about politics in his category Voting and Elections. Along with his more serious posts, Dave ventured into poetry with the post Someday. So let’s meet Dave. Hi Dave. Welcome to the couch. Sorry about the rescheduling issue but we’re on now. Talk to me about blogging. What drew you to begin blogging? I used to think that blogging was just like facebook – another place for people to share the drama in their lives. Over time, this view has changed dramatically as I have been able to gain perspective from all types of individuals. I had a variety of reasons for beginning my blog. I had been asked to start a couple of blogs for a business I was working for and wanted a platform to work with where I would not accidentally damage rankings or reputation of the business I was working for. I blogged with a free wordpress blog for just over two years, and launched my self-hosted site in November. Yes, there is definitely a vast difference between blogging and Facebook lol So how long have you been actually blogging? I have been blogging for a little over two years. Initially, I didn’t have a clear direction or goal for my blog, and I have just this January reached the 100 post mark. I am far from expert, having just recently learned some of the value of reaching and interacting with other blogs. Wow! Congratulations on that! It is quite important to interact with others on blogs as it helps in developing the sense of community out there I agree. Do you blog about anything that comes into your head or does your blog have a particular theme that you write about? The main thrust of my blog is to provide voters with pertinent information as we near elections here in the U.S. In an effort to make this useful and more available to the public, I blog my reactions to different current events which strike my fancy. My apologies to those of my friends who are from other countries and do not benefit from this information. In addition to the current events stories, I also share things on almost any topic that strikes me. Many of these stories come from my personal life. I’ve posted about my gardening endeavours, hunting stories, recently my first attempt at sharing poetry, memories of grandparents, etc. Yes, I shared the link to your first attempt at poetry. It was heartwarming. Do you believe you have gained anything from blogging? I have gained several things from my blogging already, and I only expect this to continue. First, I’ve been gaining friends around the world. I enjoy reading and trying to understand their perspectives, even when they differ from my own. Second, I’ve learned more about my own system of government while researching different topics that I have posted about. Third, I’ve gained a sense of purpose outside my work and family. It almost feels as if I can give something back to my country if I can succeed at better informing voters a couple of times each year. That’s great that you feel as if you have found a sense of purpose. Do you have any challenges in life that blogging helps you in dealing with? I guess my third thing gained from blogging ties in here. I’ve found that it has improved my time management, and helped me at times to do a little better job of getting out of my shell.Another way that blogging helps me is by reminding me how privileged my life is. Sometimes it is easy to get focused on my own problems and forget about the people around me. Then I read blogs of some of my friends who deal with things like autism, depression, grieving the recent loss of a loved one, PTSD or other problems and realize that I am very blessed. I think it is human nature to become focused on the problems of our own lives at the expense of others. I agree that reading the blogs of others helps you to realise just how blessed we are and really puts our own challenges into context. How often do you take the time to blog? When I first started blogging, I didn’t have a goal and because of this I was very sporadic. I would post five or six times in a week and then go for two or three weeks without posting. Now my goal is to post at least two times weekly. Anything above that is bonus for me. I think that’s achievable. Good for you! Apart from politics, where else do you find inspiration for your posts? I find inspiration almost anywhere. Listening to the news on the radio, reading a book, walking through the mall, in the checkout line, comments made at work – there is very little which doesn’t trigger a thought or memory. So you are constantly planning your next blog post in your head 😉 You wouldn’t be alone in that. Many people find that a quote or mantra helps them out. Do you have any that have particular relevance to you? The second is a Zig Ziglar quote and it goes like this. Great quotes and so very true. Tell me, in your wanders around the blogosphere, what do you find that draws you to other blogs? There are several things which draw my attention. Good pictures (and word pictures), humour, accounts of climes and lands other than my own, and occasionally poetry are among them. I love real life accounts of finer points of family life, cooking or camping adventures, and general happenings which might otherwise be missed in the hustle and bustle of life. That’s terrific. It’s incredible just how many diverse blogs there are out there. In closing Dave, is there anything else that you wish to share? I truly appreciate this series you have been doing. I have found several new friends and learned more about some who aren’t quite as new. I am honoured to be included, and I am grateful to be included in the greater blogging family. From the moment that the Tween and I first saw the advertisement for this movie on television we decided that we wanted to see it. Rated PG, I knew that it would be okay for us to watch as a family. Yesterday afternoon, we headed off to the theatre (with a quick stop at Spotlight beforehand so I could get that ecru cotton I needed 😉 ) and then we settled into our seats with a large box of popcorn and a bottle of water between us. I had prior knowledge that the movie (and the book) were narrated by Death. Having this knowledge allowed me to make sense of a lot of the movie as although there are references throughout that would lead the viewer to possibly identify Death as the narrator, they were subtle. I had to tell the Tween afterwards who the narrator was when she asked me. As I was already quite upset on the day that I watched this, the tears flowed freely throughout the movie. I cried at the obvious sad parts and also at the ignorance and ‘sheeple’ mentality that prevailed at this time in history. For those that are unaware, the story follows Leisel (Emily Watson) a young girl given up for adoption by a mother who is running from Hitler. Leisel (grieving the loss of her mother and brother) suddenly finds herself thrust into the home of Rosa and Hans (Sophie Nelisse and Geoffrey Rush). It takes a little time for Leisel to warm to Rosa (and vice versa) however her new Papa (Hans) instantly makes her comfortable in her new home and teaches her to read from the book she found laying in the snow prior to arriving in his home. 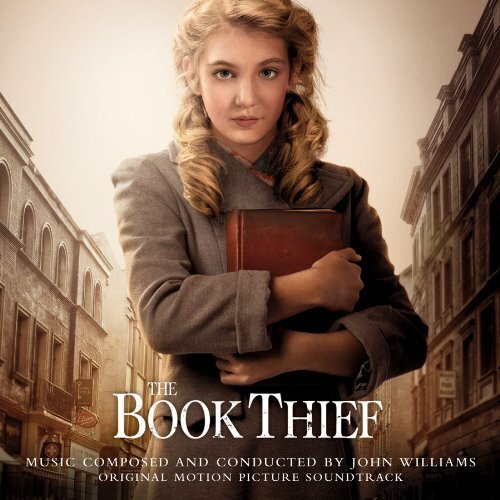 Leisel develops a love for books – something that is forbidden in the reign of Nazi Germany. I found the movie an interesting commentary on life and the fear that some have as to the power of knowledge contained within books. I was scared as I watched young children sing songs about hating others as part of their schooling and watched the mob mentality reign supreme the night that the books were burned. Whilst the movie offered some social commentary and fleeting acknowledgements to what else was occurring (e.g. the invasion of Russia and the rounding up of the Jews) at the time of the war, the movie was mostly themed around childhood friendships, loss of innocence, keeping secrets and family values. It also showed how in the time of war, those who are bullies find themselves elevated in their sense of power and belief in their own importance. Both of Leisel’s friends – Rudy (a young blonde haired, blue eyed German boy) and Max (a raven haired, dark eyed Jewish man) teach her about life. They teach her that it’s okay to trust and be yourself. They teach her that the written word is something to be revered and not frightened of. I loved that Leisel transformed the walls of the basement (with encouragement from her Papa) into a dictionary of new words that she had learned through reading books. The characters in the movie grow in your heart and I developed an affection and affinity with them. I admired Rosa for her strength of character and deep seated love for her family. I admired Hans (and not just because it’s Geoffrey Rush) for his warmth of heart, his spirit and values. I love Rudy for his boyish charm and cheeky sense of humour and although Max was brooding, he was warm and grounded and I truly loved how he turned something questionable (a copy of Mein Kampf) into a thing of promise for Leisel. Leisel herself is warm, inquisitive and has a strength of character that is admirable. There were many parts of the movie that the Tween did not understand however when I asked her afterwards what particular part it was so I could help her, she could not recall exactly what they were. Maybe in reading the book, she may find the answers to those questions. Tonight, I am chatting with the gorgeous Vic Briggs from Shards of Silence. Vic is an artist of the written word and writes both poetry and fiction using her past entwined with her imagination as her inspiration. I first met Vic when she was guesting on OM’s blog mid last year and I have followed her beautiful words since then. Recently Vic has been writing a series on do’s and dont’s of writing with her latest entitled Out of Character? She currently writes posts subtitled “Let’s Talk Opinion” in which she offers her opinion on a variety of topic including blogging – Danger Blogging. Vic’s blog is a feast of well crafted words in whatever genre she chooses to write. I have chosen Moments of You as an example of her mesmerising poetry to share with you all. Hi Vic. I’m so very pleased to have you here this evening. Please tell me how you came to begin blogging? Believe it or not, I started blogging by accident. Having come across a blog I wanted to follow, I pressed a few buttons and a few minutes later discovered that – instead of signing up to receive email updates – I had in fact created a blog of my own. This is why after posting Confession on the 31st of July 2013, no new post appeared on ShardsOfSilence for another two weeks. I remember listening to The Beatles’ “Back in the USSR” – it was late in the night and suddenly I had this need to speak up. The song had always irked me for glamorising a place that had been dominated by political un-freedom and oppression for decades, so I took to my blog to give my two cents’ worth. Once it was done, I caught the blogging bug and that was that. I became a blogger. And the blogging landscape forever changed for having your voice with in it! 🙂 So how long have you been blogging now? It’s been a little over five months: an adventure. Although it can be very time consuming, I’m enjoying being here with all of you, reading your thoughts on everything from relationship troubles to world events and sharing my own. An adventure is certainly one way in which to describe blogging that’s for sure 😉 When you began your blog, did you do so with any particular theme in mind? This is a difficult question to answer; I am after all a writer adrift. In October I dedicated several weeks to the topic of relationships. I started this project, titled Project R: Relationship Interrupted, to help a friend in need. After being abandoned by the person they believed to be the love of their life, they were struggling to cope. Guest bloggers were invited to share their insights on the topic and it was due to their generosity and frankness that my friend was able to recover and move on. I write both fiction and poetry. Both tend to be rather dark, with one exception: all articles that feature BBC Sherlock’s lead Benedict Cumberbatch have a humorous edge. If you are in need of a good laugh, that’s the category for you. “I don’t fancy Benedict Cumberbatch: Pants on Fire” has been topping the charts for quite a while. For fellow writers, the “Writing Tips” category may be of interest. I do my best to share everything I have learnt so far in the hope that others will avoid the beginner traps into which I had fallen when I first embarked on this journey. My on-going Let’s Talk Opinion series engages with other bloggers on issues close to their heart. If I come across a blog post that compels me to write a detailed reply, I tend to write a full article and include it in the series. I’ve also written pieces on politics and humour, racism and religion, as well as feminism and depression. I certainly enjoy whatever you write and the fact that you write factually is a bonus. Many bloggers have challenges and they use blogging as a way to help them through this. Do you find this to be the case for you? Yes, certainly. I was in a dark place for a long while, still finding my way out. Writing is my lifeline. Another candidate for my “Writing is the Cheapest Form of Therapy” group! 😉 So how often do you get the opportunity to blog? I post every day. It’s a good way to keep my writing muscles flexed. In the past I used to wait for the muse. Nowadays I like to think that when he grants me a visit I’d rather he found me hard at work. I like the line about being hard at work when the muse visits. Very, very cool indeed! Where do you find the inspiration for your writing comes from? From the things that I observe when out in the world, from other bloggers when on WordPress, from books I read or plays I see, from current events and from the deep well of my imagination. This world is an incredible place and if only we take a moment to take a look, it cannot fail to inspire. The world indeed is an incredible place. I concur most wholeheartedly. Now to my favourite part of the interview – do you have a quote or mantra that you believe fits your life? I like Carpe Diem. It is a very fitting quote for many. I know you are out and about in the blogosphere. Tell me, what draws you to other blogs? Honesty. It resonates with me. Although I have to admit that I am very eclectic in my choices. I will read anything if it managed to hook me in with a good title or a catchy first line. When it comes to writing my own posts as well to reading those of others I keep an open mind about… pretty much everything. There is a line however: I don’t tolerate sexism, racism or homophobia. While I cherish everyone’s right to an opinion, I also reserve the right to stand up for the norms and values that I treasure most. I guess that makes sense. You don’t need to lose the essence of yourself. Thanks so much for joining me this evening Vic. It’s been great to learn more about you. Is there anything else that you might like to share? Be yourself. Whatever you choose to write about, it is always better to be an imperfect version of yourself than a good copy of someone else. Those who visit your blog want to find out what you have to say. Be yourself, care, and your readers will care too.